From the wardrobe of Marilyn Monroe: An evening sheath of ivory crepe, embroidered overall with silvered clear bugle beads, the skirt worked with shimmering pendant bugle beads, the dress with plunging rear décolletage, the halter-neck with shoe-strings straps. 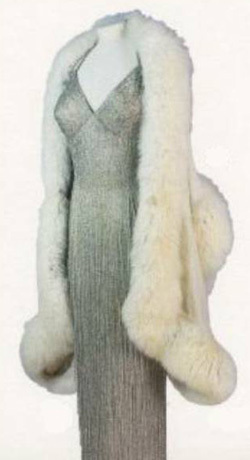 Worn by Marilyn Monroe as she was accompanied by Arthur Miller to the premiere of Some Like it Hot, 1959 and to Yves Montand’s 1959 one-man-show on Broadway. The dress was also worn by the actress in the film Let’s Make Love, 1960. Accompanied by a black and white publicity photograph of Marilyn on the set of Let’s Make Love with Yves Montand, 8×10 in.